DISCLAIMER: Your BIOPHOTON WAND™ is to be used "FOR EXPERIMENTAL PURPOSES ONLY". NOTE: Please follow these Steps CAREFULLY, thus ensuring that EFFICACIOUS Results and EFFICIENT Operation are obtained, while using your BIOPHOTON WAND™. 1. Your BIOPHOTON WAND™ can radiate a SOLID Red, Yellow or Green Light Beam, when you're operating in the SOLID Beam Mode. This SOLID Red, Yellow or Green Light Beam can then be shined onto a SPECIFIC Acupuncture Point, Trigger (center of pain) Point &/or Reflex Point or be used to "light paint" a LARGE affected Body Area (i.e. - Skin, Joints, Involved Muscles, Tumors, etc.). 2. Your BIOPHOTON WAND™ can also radiate a PULSED (appears solid above 50 Hz./pps.) Red, Yellow or Green Light Beam at a SPECIFIC Pulse Rate, using your WAVESHAPER™ Frequency Instrument in the Square Wave Mode. This PULSED (appears solid above 50 Hz./pps.) Red, Yellow or Green Light Beam can also be shined onto a SPECIFIC Acupuncture Point, Trigger (center of pain) Point &/or Reflex Point or onto a LARGE affected Body Area (i.e. - Skin, Joints, Involved Muscles, Tumors, etc.). 3. Operating Steps 1 - 6, can be ELIMINATED, if ALREADY done, when your BIOPHOTON WAND™ is being operated with your WAVESHAPER™ Frequency Instrument on a REGULAR basis in the PULSED Light Beam Mode. 4. Operating Steps 1-3 don't NEED to be done, and Steps 4 & 6 can be ELIMINATED, if ALREADY done, when your BIOPHOTON WAND™ is being operated on a REGULAR basis in the SOLID Light Beam Mode. Operating Steps: NOTE: Read and become familiar with WAVESHAPER™ Frequency Instrument - Operating Instructions, before proceeding with Operating Steps 7, 8, 9, 10a and 10b, when operating in the PULSED Light Beam Mode. 1. Push the A.C. Power Plug connected to the A.C. Power Cable, which is connected to your WAVESHAPER™ Frequency Instrument, into a HIGH Quality Surge Suppressor Power Strip (i.e.- Tripp Lite Isobar 4 Ultra, 6 Ultra or 8 Ultra), thus ensuring SAFE and EFFICIENT Operation. 2. Push the BNC Plug, which is connected on one end of the 13 ft. Cable, and which has a 1/8" Plug connected at the other end, onto the BNC Jack, that's mounted on the Front Panel (lower right corner) of your WAVESHAPER™ Frequency Instrument, and that's labeled "OUTPUT 50 ohms". 3. Push the 1/8" Plug, which is connected to the other end of this 13 ft. Cable, that has a BNC Plug now connected to the BNC Jack on your WAVESHAPER™ Frequency Instrument, into the 1/8" Jack, which is labeled "INPUT", and which is on one end of the Control Box of your BIOPHOTON WAND™. 4. Push the right-angle RCA Plug, which is connected to one end of the 10 ft. Coiled Cable, that has a right-angle 1/8" Plug connected to the other end, into the RCA Jack, which is labeled "OUTPUT" on the Control Box. 5. Push the right-angle 1/8" Plug, which is connected to other end of the 10 ft. Coiled Cable, that has the right-angle RCA Plug now connected to the RCA "OUTPUT" Jack, into the 1/8" Jack, which is on the Black Cap at one end of Metal Wand/Case of your BIOPHOTON WAND XL™. 6. Clip the Control Box onto your Belt (or skirt edge). 7. Push the POWER Button (lower left corner) on your WAVESHAPER™ Frequency 'IN' once to turn it's Power "ON". 8. Press the WAVE Button (upper right corner - display) until the Square Waveform (stairstep) appears. 9. Press the VALID Buttons in sequence on the Touchpad for the SPECIFIC Frequency, that you're needing, and right afterwards press either the kHz. or Hz. Button as required. 10a. Press the SHIFT Button and then right afterwards press the DUTY (7) Button, until the DUTY LED appears. 10b. Press the VALID Buttons for the Duty Cycle of 80% on the Touchpad, which is the MAXIMUM Seting in sequence and then right afterwards press the Hz./% Button. 11a. Flip the minature Toggle Switch on the Control Box of your BIOPHOTON WAND™ to the "PULSED" Position, when you want to operate your BIOPHOTON WAND™ in the PULSED (appears solid above 50 Hz./pps.) Red, Yellow or Green Light Beam Mode. Now turn the Amplitude (AMPL) Control on your WAVESHAPER™ Frequency Instrument CLOCKWISE to it's MAXIMUM setting. NOTE: You should now be ABLE to see the PULSED (appears solid above 50 Hz./pps.) Red, Yellow or Green Light Beam shining from the end of the Metal Wand of your BIOPHOTON WAND™, and if you do, then you can proceed to Step 12a, 12b or 12c. If a PULSED (appears solid above 50 Hz./pps.) Red, Yellow or Green Light Beam is NOT shining from the end of the Metal Wand, then you'll NEED to check your Cables, Connectors and Battery. If they seem to be OKAY, then please call me (Tom) at 614/237-2590 or email me at tharrels@hotmail.com. The PULSED (appears solid above 50 Hz./pps.) Red, Yellow or Green Light Beam won't be as BRIGHT as it is, when you're operating your BIOPHOTON WAND™ in the SOLID Mode, since you're operating your WAVESHAPER™ Frequency Instrument at 80% Duty Cycle in the Square Wave Mode. 11b. Flip the minature Toggle Switch on the Control Box of your BIOPHOTON WAND™ to the "SOLID" Position, when you want to operate your BIOPHOTON WAND™ in the SOLID Red, Yellow or Green Light Beam Mode. Now turn the Amplitude Control on your WAVESHAPER™ Frequency Instrument CLOCKWISE to it's MAXIMUM setting. NOTE: You should be ABLE to see the SOLID/CONTINUOUS Red, Yellow or Green Light Beam shining from the end of the Metal Wand of your BIOPHOTON WAND™, and if you do, then you can proceed to Step 12a, 12b or 12c. If a SOLID Red, Yellow or Green Light Beam is NOT shining from the end of the Metal Wand, then you'll NEED to check your Cables, Connectors and Battery. If they seem to be OKAY, then please call me (Tom) at 614/237-2590 or email me at tharrels@hotmail.com. If you want to be ABLE to move around MORE EASILY, operating your BIOPHOTON WAND™ in the SOLID/CONTINUOUS Red, Yellow or Green Light Beam Mode, you can pull-out the 1/8" Plug, if it's connected to the 1/8" Jack, that's labeled "INPUT" on the end of the Control Box. 12a. Hold your BIOPHOTON WAND™ like a Pen and shine the SOLID or PULSED (appears solid above 50 Hz./pps.) Red, Yellow or Green Light Beam DIRECTLY onto a SPECIFIC Acupuncture Point, Trigger (center of pain) Point, &/or Reflex Point at a Distance of NO MORE than 1/4" above the Skin or, BETTER yet, place the end of the Metal Wand NEXT to the Skin and move it in a SLOW CLOCKWISE Circle, starting about 1" from the Acupuncture Point, Reflex Point or Trigger (center of pain) Point and moving towards the center and then holding the tip in place there for 2-5 mins. NOTE: The end of the Metal Wand can also be applied with a GENTLE Pressure onto an Acupuncture Point or Reflex Point for 30-90 secs. to provide a ROUGH Diagnostic Technique, since the degree of SENSITIVITY of the Acupuncture or Reflex Point will give a relative evaluation of the status of your Health PROBLEM. You'll find that as the Condition of your Health PROBLEM IMPROVES, the Acupuncture or Reflex Point SENSITIVITY will be REDUCED! 12b. "Light paint" a Medium (more than 1/4") Body Area (i.e. - Skin, Joints, Involved Muscles, Tumors, etc.) by tracing 1" CLOCKWISE Circles with the SOLID or PULSED (appears solid above 50 Hz./pps.) Red, Yellow or Green Light Beam. NOTE: The Rate, that you use, when you trace these Circles, can be varied from SLOW to VERY RAPID. CHRONIC Condtions usually respond BEST to a RAPID Rate, whereas ACUTE Condtions usually respond BEST to a SLOWER Rate. 12c. Hold the the BIOPHOTON WAND™ like a Pen and shine the SOLID or PULSED (appears solid above 50 Hz./pps.) 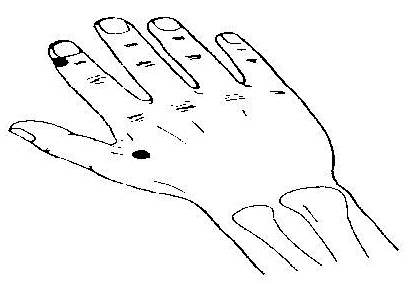 Red, Yellow or Green Light Beam DIRECTLY onto the MAJOR PAIN POINT #2 (right hand/forefinger/fingernail/lower left corner - see below). NOTE: Please follow this Step, if you want to treat your Body with a SPECIFIC Pulse Rate and there isn't a SPECIFIC Acupuncture Point, Trigger Point and/or Pain Area involved. 13. Perform the above Procedure(s) on each Point/Area, that NEEDS to be treated, for 2-5 minutes. NOTE: These Procedures can be done up to 3 times per day, and each Point/Area should receive a MAXIMUM Treatment Time per Day of 10 mins. (acute conditions) and 15 mins. (chronic conditions). If you're using MORE than one Pulse Rate, then divide the TOTAL Treatment Time of 10 mins. (acute conditions) and 15 mins. (chronic conditions) by the number of Pulse Rates to obtain the amount of Time for each Pulse Rate. Also see Frequency & Duration Of Treatments. 14a. When you're FINISHED, using your BIOPHOTON WAND™ in the SOLID/CONTINUOUS Red, Yellow or Green Light Beam Mode, please flip the minature Toggle Switch on the Control Box of your BIOPHOTON WAND™ to the "PULSE" (OFF) Position. NOTE: Eventhough the HIGH-Intensity LED Cluster (4) in the Metal Wand of your BIOPHOTON WAND™ draws ONLY 30 ma. of Current, you NEED to turn your BIOPHOTON WAND™ to the "PULSE" (OFF) Position to CONSERVE the 9 Volt Lithium Battery inside of the Control Box. 14b. Push the POWER Button (lower left corner) on your WAVESHAPER™ Frequency Instrument 'IN' again to turn it's Power "OFF", if the Treatment Session has been COMPLETED, using your BIOPHOTON WAND™ in the PULSED (appears solid above 50 Hz./pps.) Red, Yellow or Green Light Beam Mode. 2. DISCONTINUE &/or MODIFY the EXPERIMENTAL Biophoton Light Therapy Treatment with your BIOPHOTON WAND™ if the DETOXIFICATION Process comes TOO UNCOMFORTABLE, but as SOON as possible (1-2 days), please continue your EXPERIMENTAL Light Treatment. 3. Try using the Pulse Rate of 3300 pps., if you want to REPLACE the "SOLID" Postion, if you want to experiment with a NEW Pulse Rate, and/or the 9 Volt Lithium Battery is DEAD. NOTE: If the 9 Volt Lithium Battery NEEDS to be replaced, please remove the 4 screws in the Top Panel of the Control Box. Unsnap the Battery Clip connected to the DEAD Lithium 9 Volt Battery and snap-on a NEW Lithium 9 Volt Battery. A NEW Alkaline 9 Volt Battery may be used instead, but the Life of the Alkaline Battery is about 1/4 of the Lithium Battery. 4. Try using the Pulse Rate/Frequency of 5.9 & 18 pps./Hz. (scar tissue &/or adhesions) for Acupuncture Energy Field Disturbance, if you haven't been obtaining the DESIRED Results. 5. Try using the Pulse Rates/Frequencies of 10, 47, 266, 292 &/or 727.5 pps./Hz., if you haven't been obtaining the DESIRED Results. You might also want to try using the Bible Healing Codes/Pulse Rates/Frequencies. 6. Monitor the duration of the EXPERIMENTAL Biophoton Light Therapy Treatments, when you're using your BIOPHOTON WAND™, with a Digital Timer (i.e. - Radio Shack No. 63-878). 7. Clean the Lenses of the 4 - L.E.D. Cluster at the tip of the Case/Wand of your BIOPHOTON WAND™ once per week, or as NEEDED, using a 3M Lens Cleaning Cloth, thus ENSURING that the Red, Yellow or Green Light Beam is being emitted at it's MAXIMUM Output.